I remember that moment when Instagram first introduced Instagram Stories. We all thought Instagram was copying Snapchat but at that time we didn’t really know what Instagram Stories is about. And it turned out to be a better tool than Snapchat At one time, Snapchat was the fastest growing social media platform but last year Instagram has beaten Snapchat. Some celebs like Kylie Jenner started using Instagram Stories and made Snapchat lose a lot of money because of their social influence. Business owners should really start using Instagram Stories, it has so much to offer. But somehow a lot of companies don’t know how to use this new tool. Today I’m sharing why you should use it and how you can take your social media to the next level using this tool. And I’m sharing free templates with you! You can see how much views your Story has. Besides that it’s also possible to see how many people have clicked on a certain hashtag, how many decided to leave your Story and how many of them decided to swipe up. These are all relevant numbers to companies. Instagram Stories is a great way to reach both followers and people who aren’t following you yet. You’re able to add hahshtags and locations to Stories, which is a great way to reach new people. It’s a fun and creative way to increase engagement. Instagram is all about having the perfect feed and being consistent. Instagram Stories isn’t as ‘perfect’, you can share whatever you want. 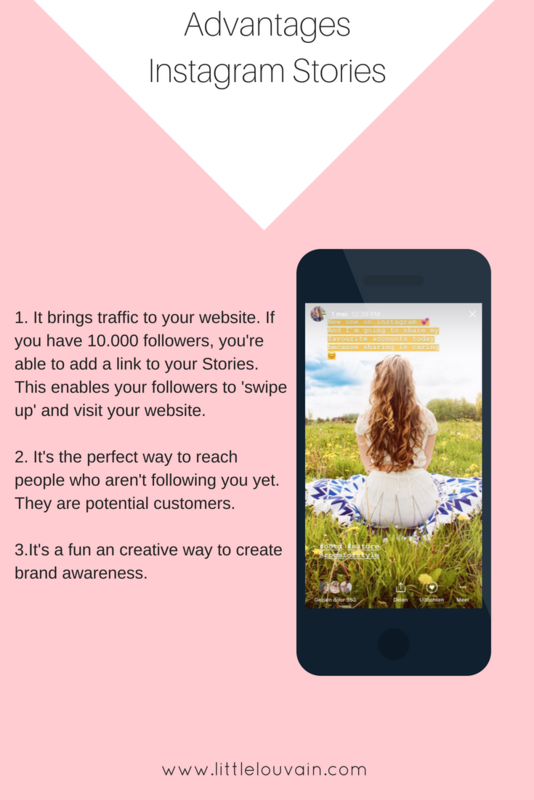 Instagram Stories is perfect to get traffic to your website. When you have more than 10.000 followers, you’re able to add a link to your Stories and followers can ‘swipe up’ to read or visit your blog post/ website. Swipe right when you’re on your homepage. Or press the little ‘camera button’ in the upper left corner to open Instagram Stories. Make a picture by clicking on the record button (the circle). Or make a video by holding the button down for as long as you want. It’s also possible to make a Boomerang, rewind or hands-free photo. Want to use a photo you took with you mobile phone? Press the little circle in the left lower corner and choose your photo. There are so many possibilities, which I’ll explain right now. 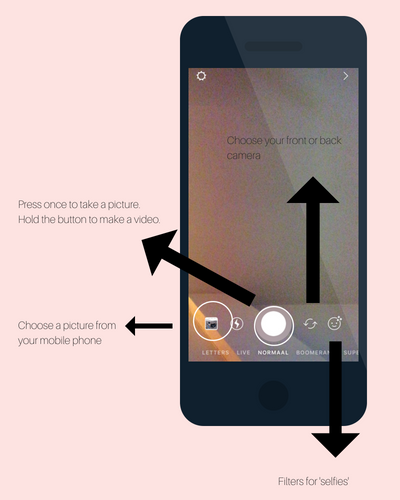 Now you know how to add photos to your Instagram Stories, but there are other possibilities as well. Once you’ve uploaded your picture, you can add stickers, gifs, locations, hashtags… You can also insert polls, which is great for business owners. If you don’t know which item you should add to your collection, you can ask clients/ followers what they would like. Add hashtags and locations if you want to reach more people. It’s possible to follow certain hashtags and your post will appear if they search for locations. In 2017, Instagram released one of it’s biggest updates: Stories Highlights and Archive. This allows everyone to create permanent collections. Story Highlights appear below your profile photo and bio, these are available for your followers to view any time, unlike Instagram Stories which is only available for 24 hours. I created 3 different hightlights all with the same branding. This is really important on social media because it allows followers to easily recognize your business. My highlights are ‘work’, ‘photo shoots’ and ‘social media’. You can create your own highlights, because branding is everything. This isn’t that difficult at all. I’ll quickly explain how you can make your own highlights. Canva is my favourite online editing tool and is completely free! Make an account on Canva because this enables you to save all your favourite designs. Click on ‘create a design‘. Scroll down and you’ll find this section ‘social media and e-mail headers‘. Choose ‘Etsy Shop Icon‘. Now you can create your own design. Click on ‘background’ to choose a background color. Go to ‘elements’ and choose ‘illustrations’ if you want to find nice icons. If your design is ready, download the picture and add it to your Instagram Story. When you look at the Highlight circles, you’ll see ‘new’. Press that button to create a new highlight. Go to your Instagram Story (the one you just uploaded), in the right corner you’ll see 3 little dots. Press it and choose ‘edit Highlight’. This enables you to edit the cover. Et voilà your highlight is ready! Another important thing you should keep in mind: Instagram Stories have certain dimensions. If you upload a photo on your Stories, Instagram will automatically change it to fit the size. The perfect dimensions are 1080px – 1920px. I always forget this, that’s why I made a custom design in Canva. This way you can add your photos to this design and the result will always turn out great. In the right upper corner of Canva you can choose for ‘Use Custom Dimensions‘. Create a template and you’ll never have to choose the dimensions ever again! It takes a lot of time and effort to make great content for Instagram Stories. That’s why I created a few free templates, which you can find on my Pinterest Board. 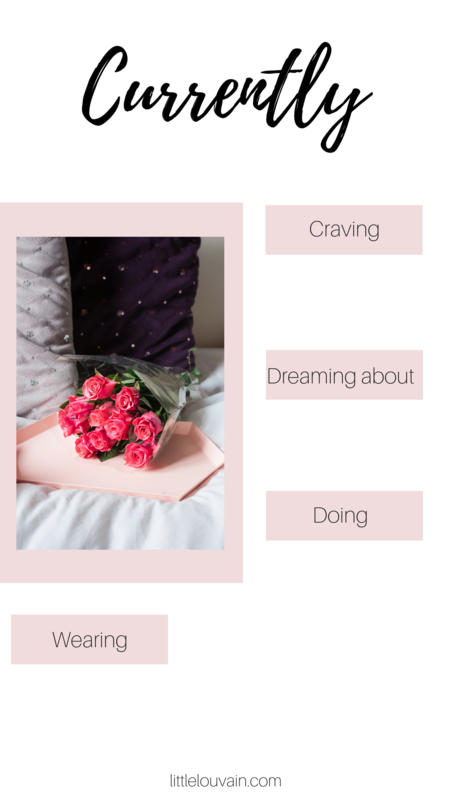 These templates were made with Canva and you can completely customize them. Choose your favourite template on my Pinterest board. Click on the link (visit the page), this will bring you to my template in Canva. VERY IMPORTANT STEP: press ‘file’ and then ‘make a copy’ in the upper corner. If you don’t do this, you’ll completely change my template. When you press ‘make a copy’ Canva will add the design to your account. Choose your colors, icons, text… Take a look at the Canva tutorials if you want to learn designing yourself. And no you don’t have to be an expert, Canva is such an easy and fun tool to use. You know how to design Instagram Stories yourself. But why do you use this? I’m sharing some great content ideas, and you’ll never run out of ideas ever again. Live video: As a business you should do a live video during an event. People who weren’t able to come to your event will see this as well. And we all love behind the scenes! Show your products. As a fashion brand it can be a great thing to show outfits and to add a link. When you have over 10.000 followers you’re able to add a link to your Stories. 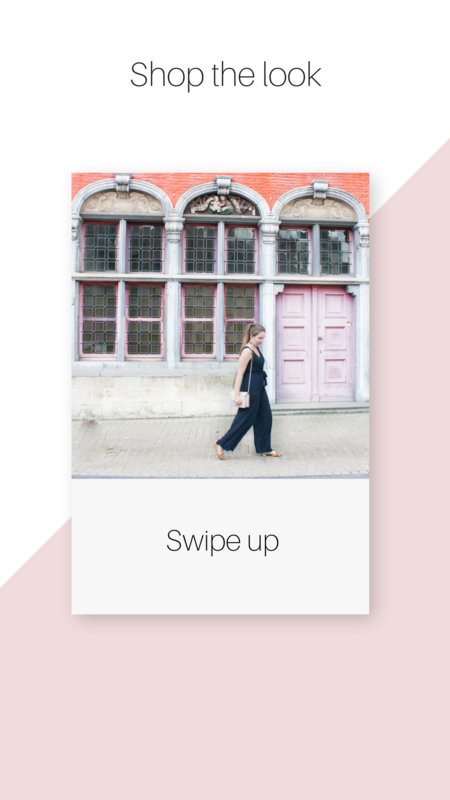 Followers can swipe up to visit the link. Share a fun quote. Something which inspires you or to motivate your followers. Share blog posts. If you’re not able to add a link, let your followers know they can find the link in the description box. Let people know what you’re doing at the moment. Instagram Stories are less ‘formal’ than your feed on Instagram. It shouldn’t be perfect. Behind the scenes. We all love to see the production process or a behind the scenes in your office. Answer some questions. On my Pinterest board you’ll find some templates where you can tell followers about yourself. Social media is all about the personal side of a business, not only the commercial side. It’s a great way to create a community. Reposts of clients. Are they using one of your products? Share the photo on your Instastories. Press coverage: share articles about your brand. Dit zijn echt goede tips! Ik ga ze zeker inzetten voor verschillende dingen :).